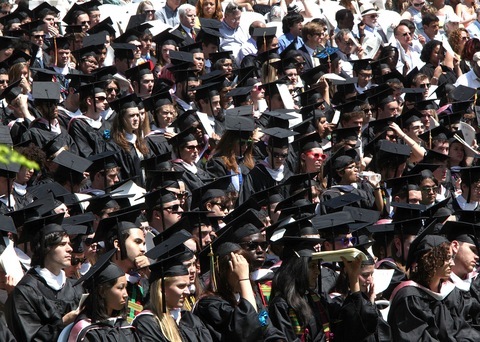 Vassar College Commencement on May 20 in Poughkeepsie, New York. Photo by Paul Zimmerman/Getty Images. In researching the growing amount of college loan debt that students are taking on as academic sticker prices steadily increase, we wondered: Is it possible to pay for college through summer and part-time jobs alone? So we compiled data from the Bureau of Labor Statistics, the National Center for Education Statistics and others to create a calculator that compares possible annual income vs. college expenses since 1976, the first year all the data we need is available. You can plug in your own hourly income as well as hours worked over the school year and during summer, and whether you attend a private or public college for a two-year or four-year program. Or, you can use our assumptions of the federal minimum wage rate — currently $7.25 an hour — with a part time job of 20 hours per week during the school year and a full-time job of 40 hours per week over the summer. Mousing over the lines shows you the college costs for that year and earnings. The difference shows whether you’ve made enough money or if you need more to foot the bill. Looking at four-year public institutions and using our assumptions for hours worked and income, average college costs actually could have been paid for up until the 2000-2001 school year. After that, a student would have to work more hours, or make more per hour, to keep up. But if a student chose a private school, a minimum-wage job on average would never have been enough to cover college costs. And even if the student worked full time throughout the year, they would only have earned enough to pay a private institution for the 1978-79 and 1979-80 school years. Did you try to pay your way through college? What was your experience like? Let us know in the comments. Paul writes: My own experience with college costs and earnings goes back further than the chart. Attending a fairly pricey private university, Brandeis, from 1962-66, yearly costs averaged about $1,850, including room and board. During those summers in which I worked full-time, I earned about $500 — about $60 a week. Had I then worked half-time the rest of the year at $30 per week, I’d have made an additional $1,300 and just about covered the bill. Luckily, I’d gotten a scholarship and didn’t have to work during the year, nor even every summer. All figures are adjusted for 2012 dollars. To determine the gap between what could be earned and what an education would cost, we compiled tuition, fees, room and board. We did not include factors such as books, transportation, health insurance, food and other cost of living expenses as these can vary wildly depending on geographic location, school, personal preference and class requirements.